Archery – that is, the use of a stringed bow to propel arrows towards a target – is thought to go back thousands of years – possibly even as far as the stone age of 20,000 BC – with bows and arrows used by numerous peoples over the millennia as a means of hunting and warfare. From the ancient Egyptians to the Shang dynasty of China (1766-1027 BC), Attila the Hun’s hordes to the great civilisations of the Assyrians, Persians and Pathians, archery was widely utilised. The need to master archery – for huntsmen and soldiers alike – inevitably led to practising the art, which in turn led to organised tournaments, the first recorded event of which took place in Finsbury in England in 1583 and included 3000 participants. The development of guns caused archery to lose its appeal on the battlefield, but it remained popular as a pastime and regular competitions were held in various countries. Archery was first included as an Olympic sport in 1900 for men and 1904 for women – one of the earliest sports for female competitors – and then in 1908 and 1920, then dropping out for a few decades before being reintroduced in 1972, since when it has been a mainstay of the Games. 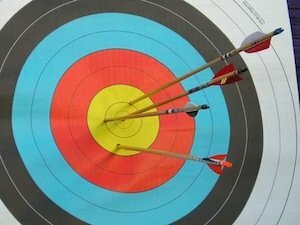 Competitive archery – that is, archery that involves archers aiming arrows at a target – has various forms, but all have the same aim: to shoot your arrows as close to the centre of the target as possible. In the Olympics competitors aim at a target from a distance of 70 metres, and rounds include a ranking round where the overall scores determine the athletes’ rankings priors to a head to head elimination format. The bowstring may have any number of strands as long as it fits the bow, and an adjustable arrow rest and a bow sight may also be used. There is little restriction over the types of arrows used, other than those that may cause undue damage to targets, though the maximum diameter of the arrow shaft should not exceed 9.3mm and the diameter of the tips should not exceed 9.4mm. The athletes’ arrows should all be marked with his or her name or initials on the shaft and all arrows used by a competitor in a particular round (or “end”) should be identical. Finger protection (including tape or gloves) may be used, as are chest protectors, arm guards and other such accessories that offer no explicit advantage other than of a protective or comfort-enhancing nature. In Olympic competition athletes must shoot 72 arrows in 12 phases, with the overall cumulative score deciding their ranking. They then go into a head to head knockout competition where they must simply score more than their opponent. Tournaments vary in format and the number of arrows competitors must shoot and the distance to the target. As mentioned it would depend on the specifics of the tournament in which the archer is competing, but in an archery competition the winner is either the person who has the highest cumulative total score after a set number of arrows, or the one who has successfully overcome all opponents faced in a knockout scenario. In the event of a tied score the archer with the highest number of 10s (including inner 10s) is declared the victor. If that number is also equal the one with the greater number of inner 10s is the winner. Alternatively – or subsequently – a shoot-off can be used to separate the competitors who have tied. Archers must adhere to all official rules in terms of the equipment they use in the performance of their sport, with the main emphasis being on them using no equipment or accessories that would give an unfair advantage over an opponent. The maximum time permitted to shoot an end of three arrows is two minutes, and four minutes for an end of six arrows. Athletes may not raise the bow arm until the signal to start is given and penalties can be given – in the form of points forfeits – if the bow is drawn after the official practice has been closed. An arrow cannot be re-shot under any circumstances. The arrow may be considered not to have been shot if it falls from the bow or misfires, or if the target blows or falls over. Extra time would be given in such circumstances. An arrow that rebounds or hangs from the target will still score based on the mark it makes on the target face. Arrows that stick – Robin Hood-style – in the nock of another shall score the same as the arrow in which they are embedded. Athletes can be disqualified, have points deducted or be banned from competition for various breaches of rules, based on the severity of the offence. If equipment is damaged, appeals can be made to the judge for such equipment to be replaced or fixed, and any time allowances will be at the judge’s discretion.